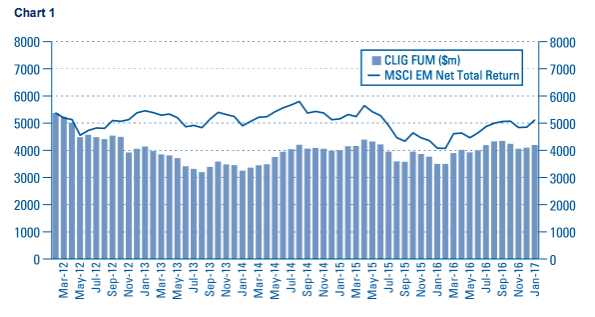 Quick update on City of London Investment (CLIG). Event: Trading update and shareholder presentation for the six months ending 31 December 2016 published 17 January 2017. Summary: CLIG had already acknowledged it would be a Brexit beneficiary, and this week’s update was the first to give shareholders some actual figures based on the weakened GBP. 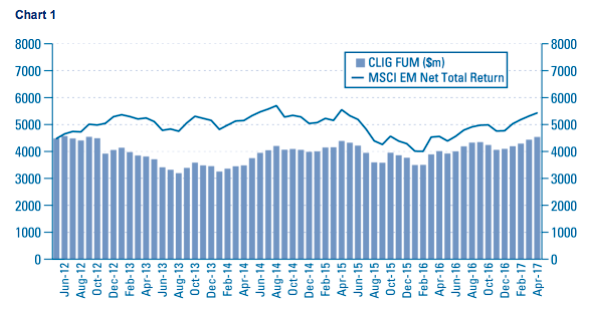 Even with client money barely moving, this emerging-market fund manager delivered a very welcome 61% profit surge to ensure the near-7% dividend yield remains safe for now. However, the usual downsides remain — not least stagnant funds under management and rising staff costs. I continue to hold. With CLIG’s revenue almost entirely collected in USD and approximately 40% of costs paid in GBP, the summary figures contained within the shareholder presentation were always going to look favourable post-Brexit. In the event, reported turnover advanced 31% while pre-tax profit surged 61%. 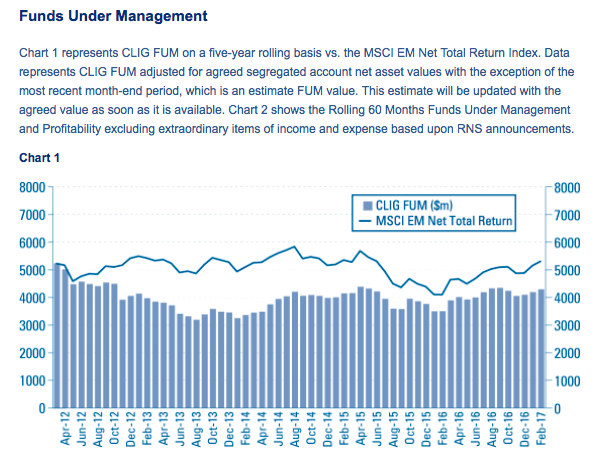 Note that CLIG’s funds under management finished the half-year at $4.1bn — versus $4bn two years ago — and so the performance was not influenced significantly by extra client money. A quick check of the archives tells me this six-month period boasted CLIG’s highest H1 operating profit — and highest H1 operating margin (37%) — for seven years. The shareholder presentation also disclosed CLIG’s balance sheet carrying a fraction more cash and investments at £12.2m. 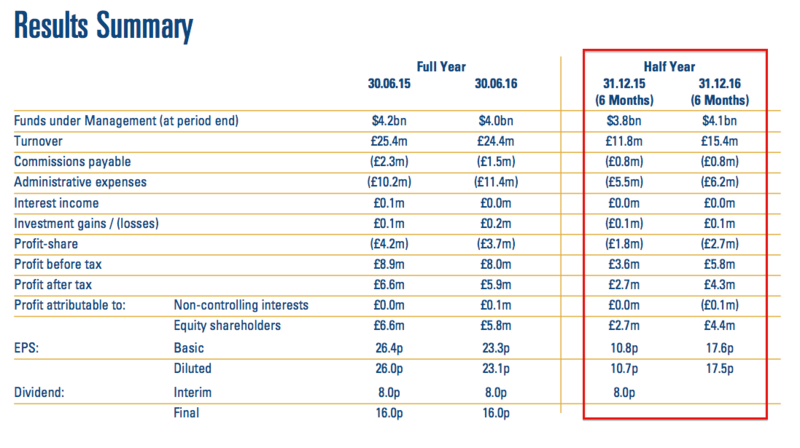 Most of the group’s first-half cash flow was spent on paying the 16p per share final dividend from last year. Sadly no word was given on future dividends. However, the vast profit improvement could mean an outside chance of the payout improving. CLIG’s dividend has been stuck at 24p per share for six years now and the current earnings run-rate (I’m guessing 29p per share, see below) may one day prompt talk of a raised payout. I’m hoping February’s full first-half statement will provide a hint about future dividend levels. The revised dividend-cover template within CLIG’s shareholder presentation suggests there could be scope to lift the payout. Essentially CLIG reckons it could now retain earnings of £2.4m during the current year — versus £1.9m previously expected. Initial assumptions for the 2017/2018 financial year indicate earnings of £3.0m could be retained after dividends (of about £6m). While CLIG should be given credit for publishing these templates — I can’t think of another quoted business that provides anything similar — I must admit they have proven to be somewhat optimistic in the past. 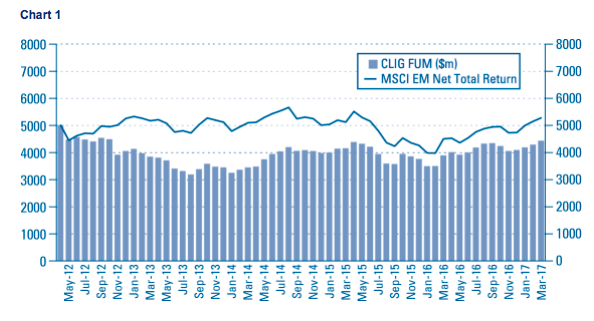 What seems to undo CLIG’s projections is a mix of falling markets and client withdrawals. 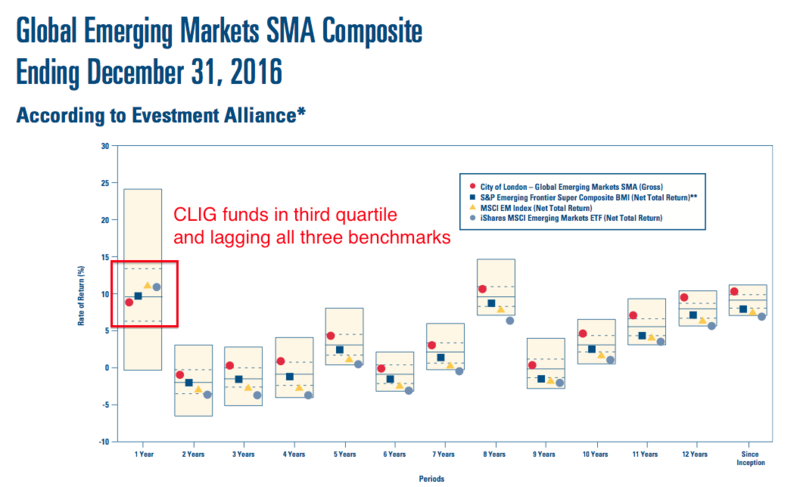 For what it is worth, CLIG estimates it can collect an extra $250m of client money during the current second half, and an extra $250m during the following financial year. (No explanation was given as to why the estimate for next year runs at 50% of this current year). I also see predicted overheads are set to rise 10%-11% on last year, and that the awful extra bonus pot will skim a projected 2% from operating profit (although the scheme can snaffle up to 5%). 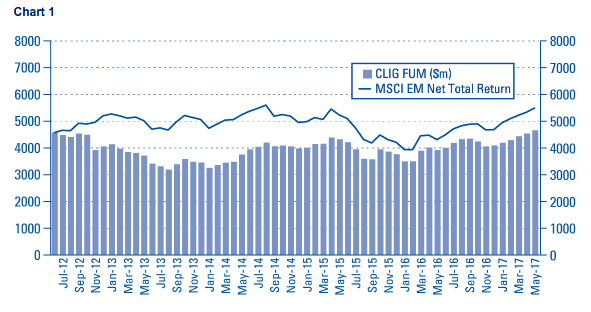 Anyway, I shall continue to ignore CLIG’s template forecasts and simply base my valuation sums on the here and now. Clients were previously expected to pay fees at 86 basis points on the money they invested. Now they are expected to pay 85 basis points. Furthermore, the cost of running CLIG’s Singapore office has increased by 6% in GBP. The old matrix would have converted $4.1bn at £:$1.23 into possible earnings of £8.60m, but the new one now gives earnings of £8.41m. The lack of progress won’t help the quest for new client money — and in turn help the group break decisively past the $4bn funds level. Paying next to nothing by 2020 no longer seems that far away. I recall past presentations showing annual marketing payments of more than £5m. Using the above exchange-rate/funds under management table, but applying a 35% staff profit share, I arrive at earnings of £7.81m or 29p per share with client money at $4.1bn and £1 buying $1.23. After adjusting for cash, investments and regulatory capital, my enterprise value (EV) for CLIG is roughly £83m or 310p per share. Dividing that EV by my earnings guess gives me a possible P/E of 10-11. That multiple does not look outlandish at present, although bear in mind i) the shares have rarely traded at extended multiples in the past, and; ii) client funds have essentially stagnated at about $4bn for five years. Meanwhile, the 24p per share dividend pays a 6.9% income. This entry was posted in City of London Investment, My Shares and tagged City of London Investment, CLIG on January 19, 2017 by Maynard Paton. Using the latest FUM/FX earnings table shown in the Blog post above, and adjusting for a 35% bonus pool, current earnings could be running at £7.98m — equivalent to 29.7p per share — with £1 buying $1.23. Following the comprehensive trading statement and shareholder presentation published in January and covered in the original Blog post above, these interim results provided little extra information. Revenue, profit and earnings were all as stated within January’s updates. The charts carried within the report were the same as those published in January, too. * Maintained 8p per share interim dividend. Simply doubling these H1 earnings gives EPS of about 34p, which provides dividend cover of 1.42x over the 24p per share dividend. Oh dear. 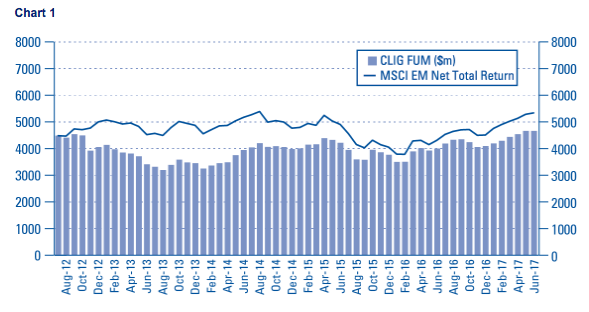 Client FUM has been stagnant at around $4bn for five years now and it does not appear emerging markets (at least in CLIG’s view) are set to surge just yet. I am not sure what to make of chief exec Barry Olliff taking a pop at corporate-governance watchdogs within this interim statement. To cut a long story short, the watchdogs reckon CLIG ought to adopt Key Performance Indicators for individual employees. iii) many financial institutions have had major troubles created by individuals who met their personal KPIs through cavalier means. Those three points are true. But it would have been easier for Mr Olliff to dismiss the watchdogs if he could point to a handsome share-price performance, bulging client FUM and upwards earnings and dividends as proof that CLIG’s existing culture works successfully. Trouble is, he can’t. Instead, the share-price, FUM, earnings and the dividend have been stagnant for five years (or more) and it is only the currency effect of Brexit that will push profit higher for 2017. I wonder why the watchdogs did not also complain about CLIG’s enhanced bonus-pool scheme. (I did…). The scheme is totally underserved given the group’s financial performance. CLIG states that 43 of 71 staff have signed up to its enhanced bonus pool (or Employee Incentive Plan). My understanding was about a third of staff were expected to join, so more than half is better than expected. CLIG claims the EIP will take the profit share from 30% to 32% of revenue for 2018, although I am more circumspect as the cap is 35%. I would not be surprised if the maximum 35% is utilised. 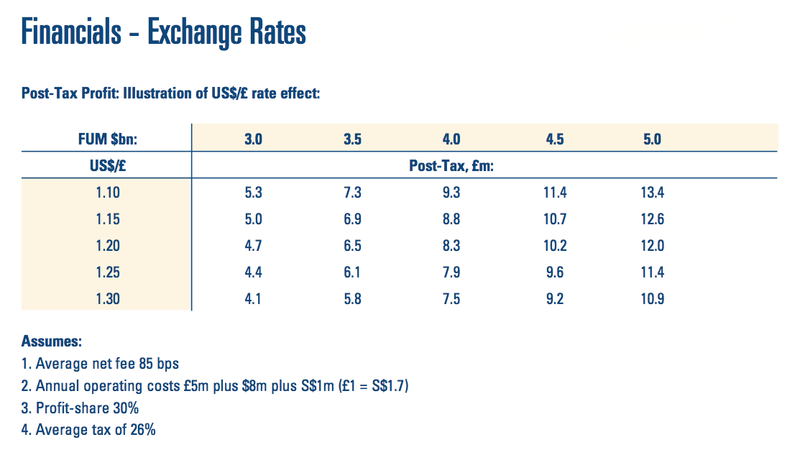 Using the exchange-rate/funds under management table in the Blog post above, but applying a 35% staff profit share, I arrive at earnings of £7.97m or 29.6p per share with client money at $4.2bn and £1 buying $1.25. After adjusting for cash/investments (£12.3m) and regulatory capital (£1.4m), my enterprise value (EV) for CLIG is roughly £87m or 325p per share. Dividing that EV by my 29.6p per share earnings guess gives me a possible P/E of 11. As usual, that multiple does not look outlandish, although bear in mind i) the shares have rarely traded at extended multiples in the past, and; ii) client FUM have essentially stagnated at about $4bn for five years (I may have mentioned that before!). Meanwhile, the 24p per share dividend pays a 6.6% income. 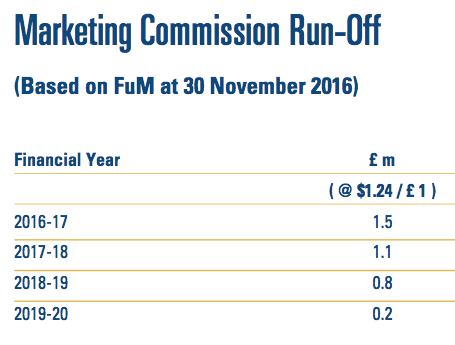 Using the latest FUM/FX earnings table shown in the Blog post above, and adjusting for a 35% bonus pool, current earnings could be running at £8.40m — equivalent to 31.2p per share — with £1 buying $1.22. Using the latest FUM/FX earnings table shown in the Blog post above, and adjusting for a 35% bonus pool, current earnings could be running at £8.55m — equivalent to 31.8p per share — with £1 buying $1.24. Using the latest FUM/FX earnings table shown in the Blog post above, and adjusting for a 35% bonus pool, current earnings could be running at £8.50m — equivalent to 31.6p per share — with £1 buying $1.30. Using the latest FUM/FX earnings table shown in the Blog post above, and adjusting for a 35% bonus pool, current earnings could be running at £8.82m — equivalent to 32.8p per share — with £1 buying $1.30. Using the latest FUM/FX earnings table shown in the Blog post above, and adjusting for a 35% bonus pool, current earnings could be running at £8.91m — equivalent to 33.1p per share — with £1 buying $1.29.